Government owned firm HAL has unveiled its twin engine 12 ton class multi-role helicopter at Aero India 2017 where more than 900 delegates including 25 foreign delegates from seven countries are participating. New Delhi (Sputnik) – India’s Defense Minister Manohar Parrikar has unveiled the full scale model of Indian Multi Role Helicopter (IMRH) at 11th edition of Aero India in Bengaluru. 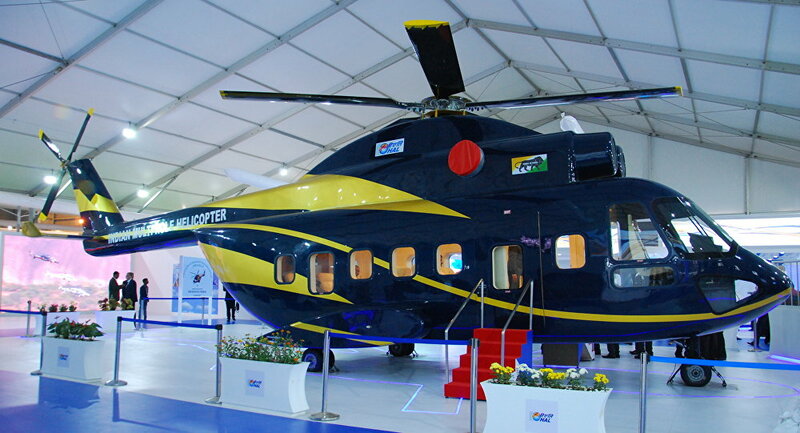 India’s government owned company Hindustan Aeronautics Limited aims to indigenously develop 12-ton class IMRH with service ceiling of around 20,000 feet, 3,500 kg payload and a seating capacity of 24. Company has also planned to develop dedicated naval version of the helicopter. Indian firm claims that IMRH will be powered by yet to be identified twin engines and will have state of the art mission systems to meet the Utility and Armed Roles of Indian Armed Forces. “Besides the domestic defense orders, HAL will target export orders, aiming to replace the ageing fleet of similar class of helicopters that are operational in more than 40 Air Forces around the world,” says official of Hindustan Aeronautics Ltd on Tuesday. HAL hopes to have the first flight of IMRH in six to seven years. However, design and development of IMRH will only commence once armed forces put up their demand. India needs more than 400 multi-role helicopters having different versions. HAL claims that IMRH will have high strategic roles in Tactical Troop Transport, Casualty evacuation, Under Slung Load, Combat Search & Rescue, Anti Surface Operations, Off-shore Operations, VIP/VVIP Transport and Air Ambulance. “The Army/IAF version will have a significant hovering and payload capability especially at high altitude,” reads a statement released by HAL. Sources say that IMRH can be good substitute for the Russian built Mi-17 and also fit the Navy’s requirement for medium-lift helicopters.